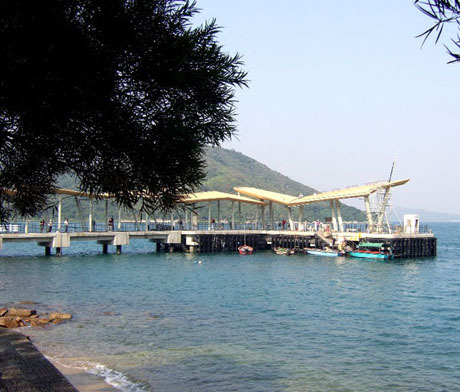 This tour of the eastern New Territories commences in Sha Tin and follows the Shing Mun River Channel, then skirts the shores of Three Fathoms Cove before passing through the Sai Kung East Country Park where only authorised vehicles are allowed to enter and reaching the coast at Wong Shek Pier then returning to Sai Kung town. There is the opportunity to visit one or more of Sha Tin’s attractions, view outstandingly picturesque coastal and rural scenery and spend some time in busy and outstandingly picturesque Sai Kung. 5. KMB Bus 92 to Diamond Hill MTR Station or 1A Green Minibus to Choi Hung MTR Station. 6. MTR Kwun Tong Line to Kowloon or Hong Kong Island (changing lines as necessary). 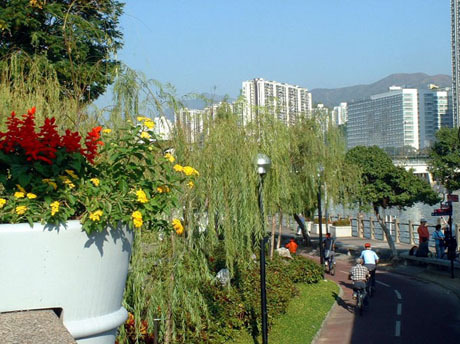 SHA TIN – is one of Hong Kong’s more pleasant new towns located alongside both sides of the Shing Mun River Channel on the northern side of the Kowloon hills in the New Territories. Several road tunnels link Sha Tin to Kowloon and the western New Territories. 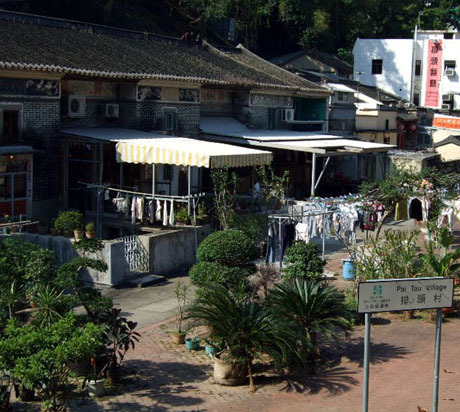 The town is surrounded by hills on two sides and home of one of Hong Kong’s two racecourses, Chinese University and Hong Kong Heritage Museum. Current population is about 680,000 living mostly in high rise apartment blocks. It hosted the Beijing 2008 Olympics and Paralympics Equestrian jumping and dressage events which were held in Hong Kong in August and September 2008. 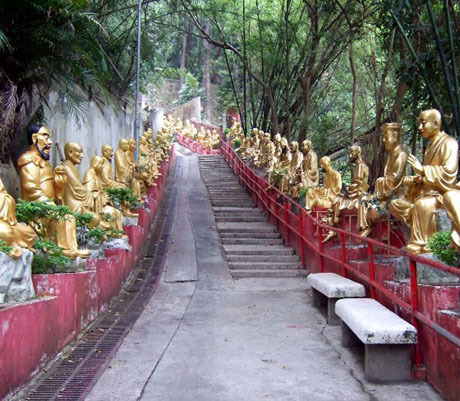 There are several attractions worth visiting in Sha Tin and for the purposes of this tour visits to the Ten Thousand Buddhas Monastery and riverside are recommended in order to allow plenty of time to complete the rest of the tour. The station is linked via Citylink Plaza to the huge New Town Plaza Shopping Mall. 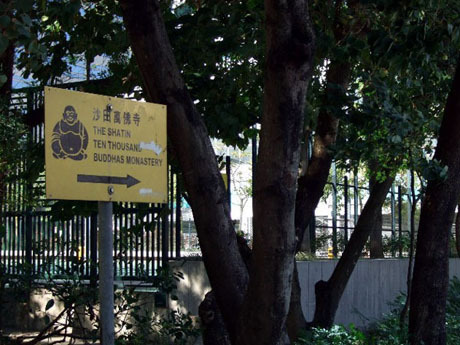 To reach the Ten Thousand Buddhas Monastery do not go into the shopping mall. Instead take the exit to the outdoor bus terminus in front of station exit B. Walk the short distance down the ramp from the bus station to street level and towards the prominent Grand Central Plaza with its tinted windows and where an IKEA store is located. Along the way on the left are some well preserved traditional houses at Pai Tau Village, now looking somewhat out of place surrounded by modern development. There are none of the familiar tourist direction signs but there are some old yellow direction signs leading to the monastery although these are not very conspicuous. Continue a short distance to Pai Tai Street alongside Grand Central Plaza follow Pai Tai Street to Sheung Wo Che Road, first street on the right where Shatin Government Offices are located and follow it to its far end where it meets a concrete path which leads up to the monastery. Be careful not to confuse the Ten Thousand Buddhas Monastery with the Po Fook Hill Ancestral Halls which is a more modern development below the monstery at the end of Pai Tai Street. There are some 400 steps to climb which can be particularly exhausting in hot weather although there are stone benches for respite along the way. The steps are lined for most of the way with life sized colourful gilded gold statues depicting the Buddha’s followers in different poses. TEN THOUSAND BUDDHAS MONASTERY - the monastery, founded by Reverend Yuet Kai took eight years to build and was completed in 1957. 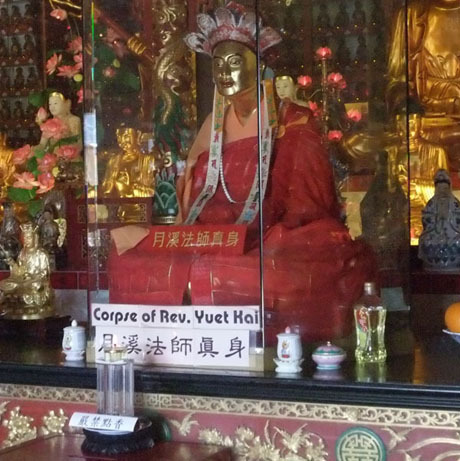 Rev Yuet Kai died in 1965 at the age of 87 and his preserved body, coated with Chinese lacquer and gold leaves, is on display in front of the altar in the main temple. Also in the main temple are the “10,000” miniature Buddhas which actually number over 12,800, each in a different pose. The monastery is divided into upper and lower levels over eight hectares and comprise five temples, four pavilions, one pagoda and one veranda. The nine-storey pagoda is located opposite the main temple and visitors can climb to the top storey via its internal circular staircase. The other temples are The Temple of God Heavens, The Candi Buddha Temple, Kwun Yam Temple and The Temple of The Nei Tor (Amita) Buddha. 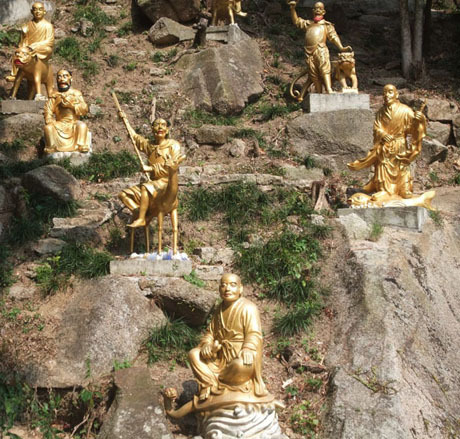 Recent additions at the top level of the temple complex include a columbarium, golden statues seated amongst a rockery and a white buddha statue in front of a waterfall. The monastery is open daily from 09-00 to 17-30 and admission is free. Return to Sha Tin Station either via the same steps taken to reach the monastery or the steps from the far corner of the courtyard outside the main temple. Before leaving Sha Tin visitors should take the opportunity to visit the riverside, a short distance from the station. To get there from the station entrance, walk through the impressive New Town Plaza shopping mall and follow the escalators down to ground level exit leading to the piazza. Immediately behind the piazza is Sha Tin Town Hall. On the opposite of the town hall is Sha Tin Park and the riverside is just beyond. NEW TOWN PLAZA - is a huge modern shopping an entertainment mall in two phases, I and III (phase II has not yet arrived). The station exit leads via Citylink Plaza into phase I for which a major renovation scheme was completed in late 2007. There are over 400 shops, cafes and restaurants. On Level 3 Podium is Snoopy’s World (open 10-00 to 20-00 daily) and Level 7 has a roof garden (open 12-00 to 22-00 daily) with musical fountain (performances at 13-00, 14-00, 14-45, 16-45, 19-00, 20-00 and 21-00 daily with an additional performance at 15-45 at weekends and public holidays). Most cafes and restaurants are located on Levels 1 and 7. SHA TIN PARK – a picturesque lengthy and narrow park along the riverside with gardens, ponds, fountains, waterfalls, bridges, playgrounds, artist’s corner, covered amphitheatre and refreshment kiosks. At weekends, particularly Sunday there is usually entertainment in the park and surrounding area. The park is open daily 06-30 to 23-00. 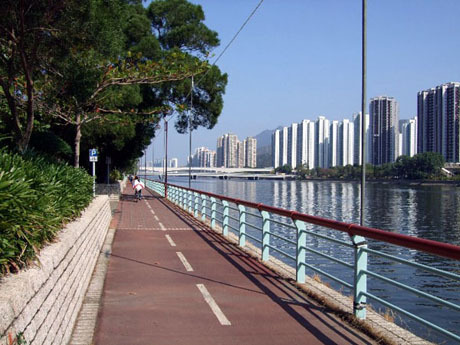 SHING MUN RIVER CHANNEL – is a man made 7km channel running Shing Mun Reservoir at the foot of the Kowloon hills through Sha Tin and Ma On Shan into Tolo Harbour. The pedestrian bridge visible is Lek Yuen Bridge and beyond downstream is the Sand Martin (road and pedestrian) Bridge. Looking back upstream is the Lion Bridge and just beyond this on the northern river bank is the Hong Kong Heritage Museum. There is a very popular cycle track along the riverside leading to Tolo Harbour. The opposite bank is lined with dozens of high-rise apartment blocks dwarfed by the hills and peaks of Ma On Shan Country Park. Retrace your steps to New Town Plaza where Sha Tin Central Bus Terminus is located underneath. Take KMB (double-deck) bus 299X for Sai Kung which leaves from bus stop B1 every 6/15 minutes daily until midnight. From the terminus the bus crosses Sand Martin Bridge over the river channel and then follows the riverside past Banyan Bridge, Dragon Bridge and then crosses an inlet of the river at the granite built Star Seafood Floating Restaurant. On the opposite bank the grandstands of Sha Tin Racecourse come into view where crowds of up to 80,000 gather, usually on Saturdays or Sundays. The course has both turf and all-weather tracks. At the Shek Mun Interchange the bus passes under Tate’s Cairn Highway and away from the riverbank past Sha Tin Hospital and on to Ma On Shan, another fast expanding new town. The town is dramatically overlooked by the daunting Ma On Shan Peak and Hunchbacks in the country park above. The bus passes through Ma On Shan along Sai Sha Road and soon the modern development gives way to some outstanding scenery with Tolo Harbour on one side and on the other the steep forested slopes soaring up to Ma On Shan Peak. A little further along the road runs above the scenic western shores of Three Fathoms Cove, sandwiched between the hills of Sai Kung West and Ma On Shan Country Parks. After leaving the cove the road runs through a valley and you should prepare to leave the bus soon. Bus stop names are displayed inside the bus and as soon as the bus leaves a stop the next stop name is displayed in Chinese, then English then Chinese again. The English display, however, is very brief and passenger need to watch carefully when trying to identify a stop. The stop to disembark at is “Mak Pin” and the stop prior to this is “Wong Chuk Wan”. The “Mak Pin” bus stop is immediately after a roundabout where Sai Sha Road ends and joins the road from Sai Kung into the country park. The journey time from Sha Tin to Mak Pin is about 45 minutes. Cross to the bus stop on the opposite side of the road and wait for the KMB Bus 94 for Wong Shek Pier. The 94 bus runs until 21-00 daily (last departure from Wong Shek Pier is 21-35) and the frequency is 30 minutes, mainly on the hour and half-hour from Sai Kung and Wong Shek Pier. On Sundays and public holidays there are two additional bus services along this route (Citybus 698R from HK Island and KMB 96R from Diamond Hill MTR Station, Kowloon). 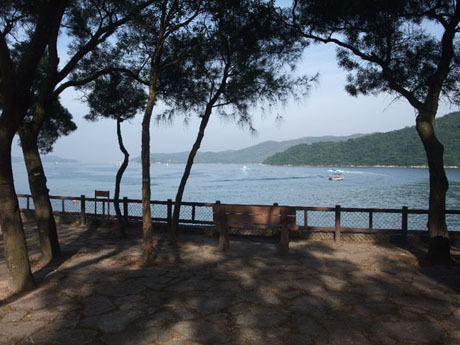 The road hugs the picturesque coastline, past barbecue areas, around the tranquil waters of Sai Kung Bay dotted with numerous small, mostly uninhabited islands before turning inland to Pak Tam Chung where there is a holiday camp and country park visitor centre with barbecue area. This is a very popular area for hiking at weekends being in close proximity to the MacLehose and other trails. The road beyond Pak Tam Chung is restricted to authorised vehicles only and the entry barrier is lifted to allow the bus through. Shortly the bus will turn off to the left near the Lady MacLehose Holiday Village, a residential and day recreational centre named after the wife of a former governor of Hong Kong, whilst the road ahead leads to High Island Reservoir. The bus follows the twisting, turning road and climbs between steep sided forested hills with waterfalls and occasionally buffalo straying onto the road before reaching Pak Tam Au, another popular hiking spot on the MacLehose Trail with rest and barbecue area before starting the descent to Wong Shek Pier. Soon there are breathtaking views of the bay and surrounding hills ahead before reaching the pier. The journey takes about 25 minutes to reach the pier. WONG SHEK PIER – The pier which lies in beautiful surroundings on the southern shore of Tai Tan Hoi Hap (Long Harbour) has undergone a major reconstruction which was completed in 2007 and bears little resemblance to the structure which existed there before. The pier serves a link to several small islands and coastal villages and ferries loading and unloading supplies are a common sight and the bay is usually dotted with small boats and windsurfers. Adjacent to the pier is a windsurfing centre and large picnic area. On a weekday this is a very tranquil and peaceful spot unless you happen to encounter one of the parties of schoolchildren which occasionally invade the area. At weekends the area becomes much busier and sometimes additional buses run to meet demand. There are steps leading to a family trail and tree walk and climbing these steps leads to wonderful panoramic views across the bay to Grass Island, Ko Lau Wan, Wan Tsai and Sharp Peak. This is another location popular with hikers and there is a trail which leads round the coast to join the MacLehose Trail for the popular walk to Tai Long Wan, Hong Kong’s best beach. There is a popular BBQ and picnic site adjacent to the bus terminus with scenic views across the bay to forested hillsides. Take the 94 bus back to Sai Kung Bus Terminus. There is more picturesque coastal scenery on the later stages of the journey between Mak Pin and Sai Kung Town. 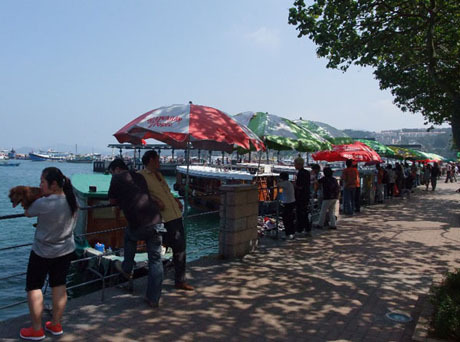 The ride takes 30/35 minutes and the bus terminus at Sai Kung is located next to the promenade. SAI KUNG - is a busy coastal town with very picturesque harbour overlooked by the hills of Ma On Shan Country Park dominated by the towering Ma On Shan Peak. From the promenade there are scenic views to small islands throughout the bay. 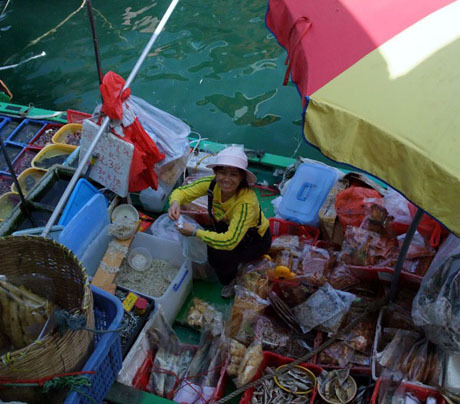 Fishing boats form a floating market and line the quay displaying their catch and selling direct to locals and the many seafood restaurants. Fish are prepared, bagged and passed up to the quay in fishing nets and dollars are tossed into the nets in exchange. 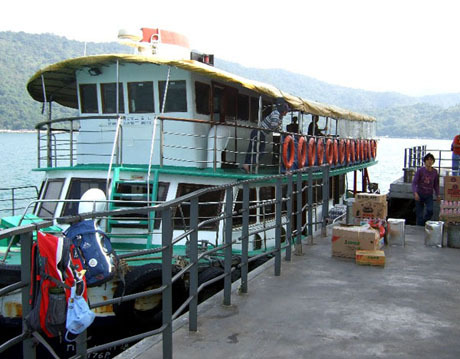 Sampans and kaidos ferry people to the islands and ply for trade with visitors. The 36 hole Hong Kong Jockey Club Public Golf Course lies offshore on the idyllic island Kau Sai Chau. There is a ferry service every 20 minutes for the 15 minute journey to the island which is not restricted to golfers. The service is popular with both locals and visitors taking a trip to the restaurants and café’s in the golf centre which are open to the public. Minibuses transport ferry users the short distance from the pier to the golf centre. The ferry fare is paid on the island before the return journey. The last ferry back from the island is at 20-00 on Mondays and Thursdays and 22-00 on other days. 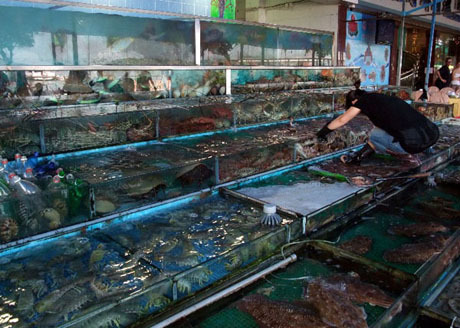 There are several seafood restaurants on the promenade with tanks of live fish allowing diners to select and have cooked. Away from the promenade along Sha Tsui Path around the central square are several international restaurants including Thai, Indian and Mediterranean. There is a Starbucks coffee shop on Chan Man Street and for fast food junkies there is a 24-hour MacDonalds, also on Chan Man Street. From Sai Kung Bus Terminus KMB service 92 runs to Diamond Hill MTR Station at 12/20 minute intervals until 23-45 daily. The journey takes about 40 minutes and from Diamond Hill Station there are frequent train services to other parts of Kowloon and Hong Kong Island. There is also a 24 hour frequent green minibus service 1A/1M/1S from Sai Kung to Choi Hung MTR Station in Kowloon which is much faster, taking about 20 minutes. The Sai Kung green minibus station is next to the main bus station and the stop for Choi Hung MTR Station is on Clearwater Bay Road (the bus makes a right turn at traffic lights at the bottom of a hill to join a dual carriageway and the next stop is outside the station entrance and is where most people disembark). The journey from Sai Kung runs along the coast road, Hirams Highway skirting Hebe Haven and Marina Cove where there is a branch of the Royal Hong Kong Yacht Club before climbing over the eastern fringe of the Kowloon hills and descending to the urban districts of north Kowloon.